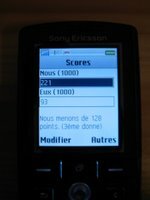 Vous êtes accros aux cartes et à votre natel ? 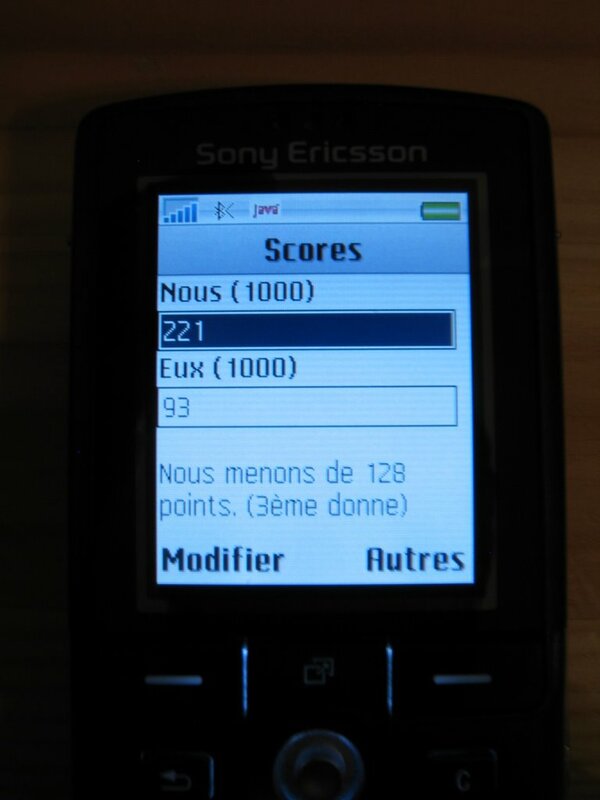 Alors je suis sûr que vous adopterez Jasscore. 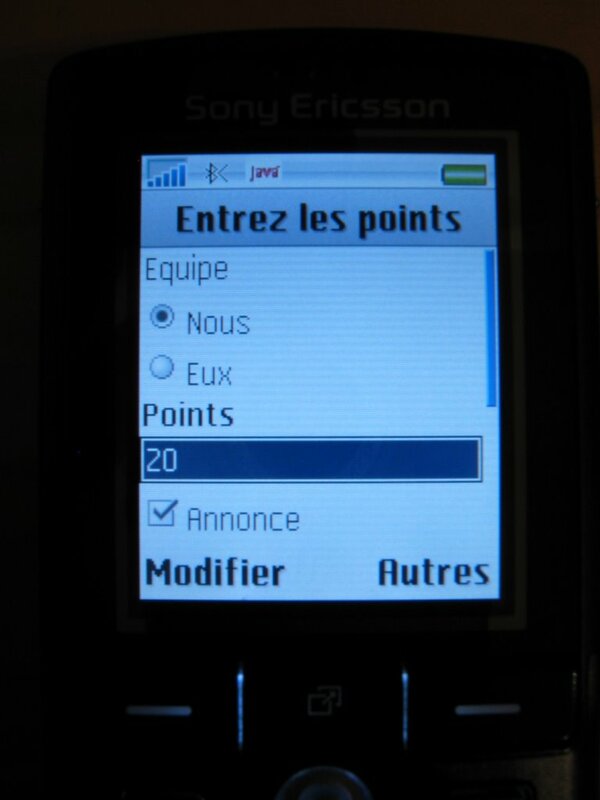 Avec ce midlet, vous pourrez tenir les scores d'une partie de jass (chibre, mise, etc.) encore plus facilement qu'avec une ardoise. Je vous laisse juger par ces quelques captures d'écran. Aucune documentation n'a été écrite car Jasscore devrait être assez intuitif. Si toutefois vous avez des questions, n'hésitez pas à laisser un commentaire ou bien à m'envoyer un message. 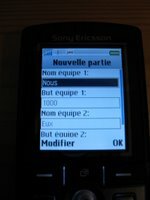 Référez-vous à la documentation de votre natel. 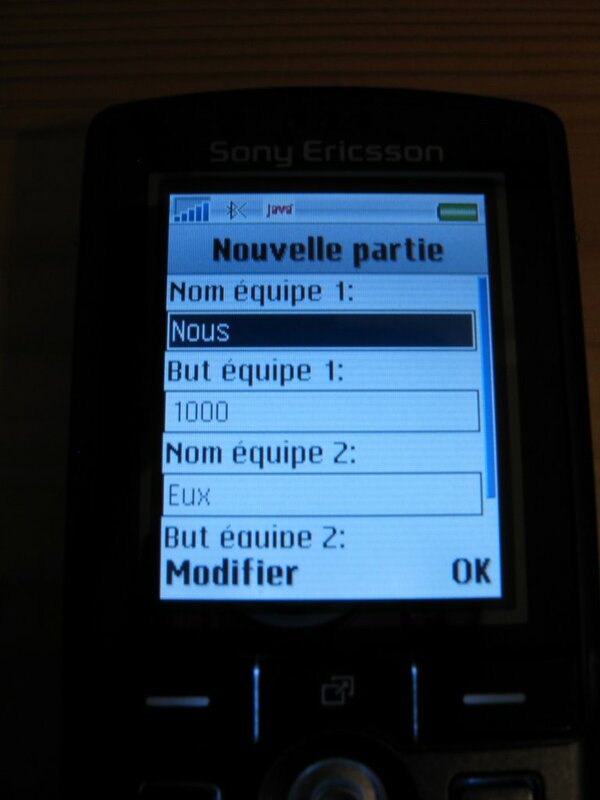 Si celui-ci supporte le bluetooth, il vous suffit d'envoyer le fichier Jasscore.jar et il devrait s'installer automatiquement. I personally dislike the default Mail.app icon. Instead I chose to use the yellow mailbox from cocoricones. It looks really nice and is not blue as almost all other Apple icons! You can also download it in .icns format ready to replace Mail.app icon. I was unsatisfied to have to revert back to subversion 1.3.2 because Xcode (v2.4) does not yet support the new format of subversion 1.4 .svn/entries file (see my previous blog entry: Xcode and subversion 1.4 incompatibility). So I wrote a SIMBL plugin that adresses this problem. Update: Xcode 2.4.1 addresses this problem so my plugin is not needed anymore. Xcode will unfortunately not work with the latest version of subversion, i.e. version 1.4. The reason behind this dysfunctionment is the new format of the .svn/entries files (see subversion 1.4 release notes). The new format is no more friendly xml. Xcode thus does not find the url=... node and fails with this rather sparse warning: NSScanner: nil string argument. The solution to this problem is to revert to subversion 1.3.2 until Apple fixes the subversion plugin for Xcode, maybe in the next version. mach_inject is a very clever piece of hack that allows an application to inject and execute code in another running process. It was initially written for PowerPC Macs only. Recently, Bertrand Guihéneuf ported mach_inject for Intel Macs. The big difference between the two version lies in the privilege level they require. The PowerPC version works with standard user privilege whereas the intel version requires more privileges to work. mach_inject is used for example by virtual desktops applications like Desktop Manager and VirtueDesktops. They legitimately requires the ability to inject code in the Dock as it is the only process allowed to manipulate all the windows. But running code under the identity of another process is a high security risk. That's why Apple introduced a new security feature in Mac OS X 10.4.4 (for Intel Macs only) that prevents mach_inject to work. Technically, any process not belonging to the procmod group or not running as root will fail to call task_for_pid which is a necessary step in the process of code injection. There are several solution to this problem which are not all equivalent from a security point of view. 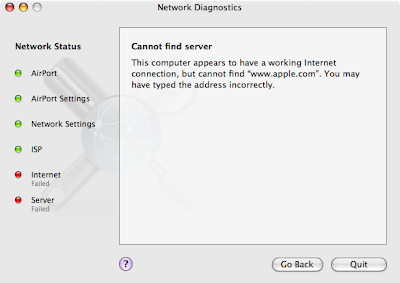 The first solutions that surfaced were proposed by Jason Thames on osx86project forum. His first proposal is to add yourself to the procmod group. His second proposal is to change the security policy of the task_for_pid call. Unfortunately, both solutions are bad solutions, the former at a single user level, the latter at the computer level. The good solution is to set the permission on a per application basis rather than on a per user/computer basis. Unix permission mechanism is perfectly suited to perform this task. You can do it manually with a terminal, Niko explains the procedure on his blog. This works very well but is a bit tedious for users reluctant to use a terminal. The best solution is that developers who legitimately require mach_inject functionality make use of the Security/Authorization API for asking users their administrator password in order to be able to change their application's executable group to procmod and set it's set-group-ID-on-execution bit. VirtueDesktops is the first to my knowledge to do so. 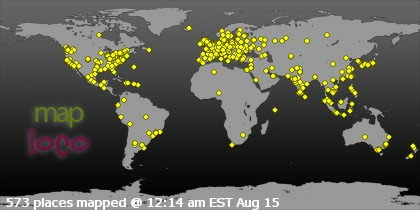 You can see the source on VirtueDesktops trac to understand how this can be performed. I strongly encourage developers to use the self-authorizing mechanism mentioned above as this will be beneficial for users both in a security and an ergonomic point of view. On ne le répétera jamais assez, votre banque ne vous enverra jamais d'e-mail vous demandant de vous authentifier dans le jour même sous peine d'avoir votre compte fermé! Lorsque l'on passe le curseur sur l'URL, on constate vite la supercherie: l'URL n'est pas du tout la même que celle annoncée dans le corps de l'e-mail. Une petite vérification avec un whois nous confirme que ce n'est effectivement pas le site web de PostFinance. GNU lightning is a library that generates assembly language code at run-time. This is an useful tool for writing a Just-In-Time compiler. While your jit compiled code will work on most systems, you will probably experience crash under Mac OS X with an EXC_BAD_INSTRUCTION exception on a movdqa %xmm0,32(%esp) instruction. The reason if this crash may seem obscure but is in fact simple: on Mac OS X, the stack must be 16-byte aligned at the point of function calls. This is documented in the Mac OS X ABI Function Call Guide. So, how to fix this problem ? Align the stack manually by jit compiling special instructions before every function call depending on the number of parameters pushed ? This is quite tedious. A better solution is to use gcc's -mstackrealign switch. the runtime stack. This supports mixing legacy codes that keep a 4-byte aligned stack with modern codes that keep a 16-byte stack for SSE compatibility. The alternate prologue and epilogue are slower and bigger than the regular ones, and they require one dedicated register for the entire function. 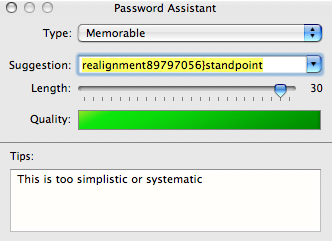 This also lowers the number of registers available if used in conjunction with the "regparm" attribute. Nested functions encountered while -mstackrealign is on will generate warnings, and they will not realign the stack when called. Here is a code snippet of a relaunch helper tool with instructions to use it.